After only getting my haircut on Sunday, I want to get it cut shorter into a long bob. I've seen a lot of bloggers going for the chop and I'm experiencing hair envy. I've never had really short hair but I'm craving it now - maybe I'll wait a while when it's my birthday to get it done. I'm working lots of hours this week, I do get Christmas day off but I wish I had more time off. It makes me miss being a student and getting lots of time off. I've decided that I need to start applying for jobs asap! I've got a long list of jobs I want to apply for so I need to get round to it at some point. The moment I hand in my notice to my manager will be brilliant! I've officially finished all my Christmas shopping, and I've wrapped all the presents. I definitely think buying presents is my favourite part of Christmas. I like guessing what people might like. I hope you all have a lovely week and a good Christmas! What are you getting up to on the big day? Let me know in the comments! Buying presents for my loved ones is my favorite too.. I enjoy giving so much..! Hope you have a Merry Christmas...! I hope you will follow me back too! Oh my - I haven't have profiteroles in an age - they are always so so tasty! I love your shirt and the Barry M nailpolish, very cute :)! Also, I really like long bobs, but I am sooo afraid to cut my hair because it's quite long now and I saved up for it for quite a while. 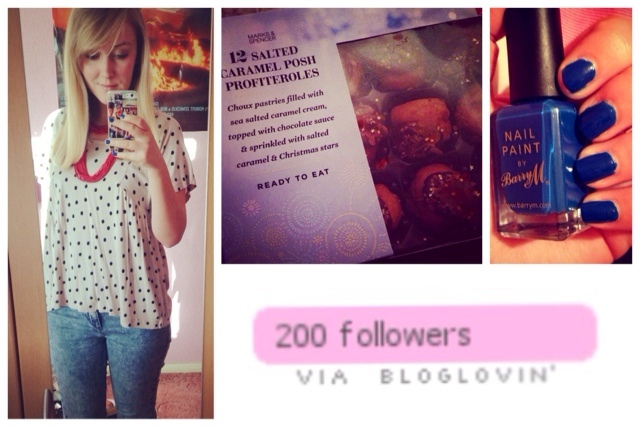 Congrats on 200 bloglovin followers! Happy holidays!